As mentioned above, MannKind recently reported earnings for the fourth quarter, widely missing analyst expectations. So, what was it that caused earnings to come in with such poor results? Well, it was a mix of things. It all started with Sanofi. For quite some time, Sanofi has been in charge of the commercialization of Afrezza, an inhaled insulin created by MNKD. Unfortunately, Sanofi decided to drag its feet on the commercialization, leading to poor sales. In the mean time, MNKD was in the process of canceling the agreement with Sanofi in order to take over commercialization on their own, but of course, that came with expenses. Unfortunately, in the fourth quarter, the company brought in absolutely no revenue, and the expenses involved in running the company were much higher than expected. However, this isn’t the end of MNKD. As mentioned above, we’re seeing rather surprising activity out of MNKD at the moment. Currently (1:28), the stock is climbing, trading at $1.79 after a gain of $0.24 or 15.59% thus far today. So, what is it that has the bulls running the show on MannKind at the moment? Well, the answer is relatively simple. You see, as soon as Afrezza was improved, investors proved to be overwhelmingly excited about it. Ultimately, Afrezza is a treatment that could revolutionize the way we treat diabetes. However, the declines were the result of poor sales as Sanofi dragged its feet. Nonetheless, in January, it was announced that the agreement between MNKD and Sanofi was coming to an end. This was a huge announcement because it gave MannKind the ability to promote Afrezza on their own. In the beginning, MNKD sank as investors didn’t know quite how the company planned on promoting its flagship treatment. However, there’s been quite a bit of news over the past couple of months, and the plan seems to be coming together. Most importantly, MNKD has partnered with specialized diabetes care centers that will be treating diabetes in real time with Afrezza. Not to mention, the company recently brought on a new Chief Commercial Officer that will likely boost the commercialization of Afrezza in a big way. I’ve been following MNKD for quite some time, and I’ve maintained a bullish opinion throughout. While I’ve caught quite a bit of flack from the community about it, my opinion has not changed. To this day, I’m expecting to see exorbitant gains out of MNKD in the long run. The truth is that Afrezza is an incredible product that is needed in a big way by the diabetic community. Outside of Afrezza, MannKind is working on new indications for the technology that made Afrezza possible, Technosphere. This is another area where, in the long run, MNKD is likely to see incredible profits. All in all, I’m expecting to see great gains out of this stock moving forward. Where do you think MNKD is headed moving forward? Let us know your opinion in the comments below! 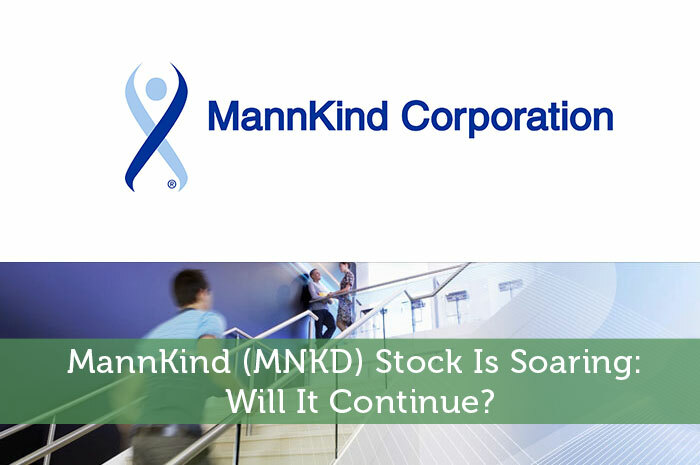 MannKind (MNKD) Stock Is Soaring: Will It Continue?